In a large pot, combine the corned beef and its seasonings with the beer, onion, garlic, bay leaves and 12 cups of water and bring to a boil over high heat. Cover and simmer over low heat until the beef is tender, about 2 hours and 30 minutes. Meanwhile, in a medium saucepan, combine the potatoes with the vinegar, mustard seeds, sugar, salt and 3 cups of water and bring to a boil. Simmer over moderate heat until the potatoes are tender, 12 to 15 minutes. Transfer to a large heatproof bowl and let cool completely in the liquid. Stir in the cabbage and refrigerate for 1 hour, stirring occasionally. Drain well, transfer to a serving bowl and stir in the parsley. Transfer the corned beef to a carving board and let rest for 15 minutes, then slice against the grain. Serve alongside the salad, passing the mixed mustards at the table. 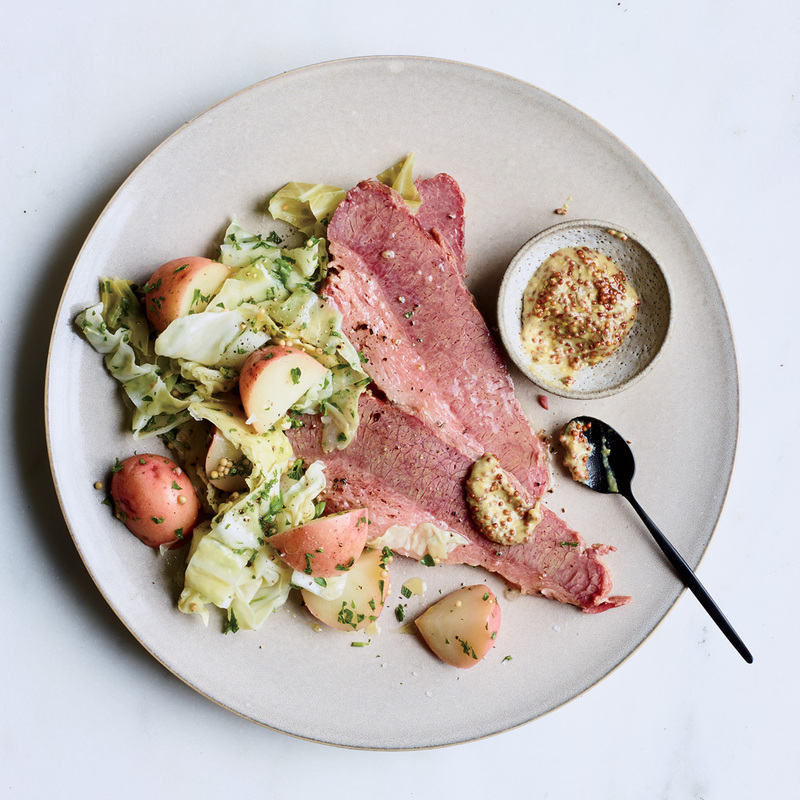 The sliced corned beef can be refrigerated in the cooking liquid for up to 3 days. Review Body: Tried this last night......never again. The corned beef was tough although I will admit it had nice flavor. The potatoes and cabbage? ICK ICK ICK. The cold potatoes were awful. We poured some cole slaw dressing on the cabbage and it was edible but not much more. Next time just give me my good old fashioned New England boiled dinner!! Review Body: Ummm so where is the recipe for the pickled cabbage? You've got the cabbage stirred in raw with the cooked potatoes. Review Body: The corned beef is good. The potato and cabbage are not. Review Body: I make this every year for my family along with cabbage. Review Body: The cabbage and potatoes were TOO vinegary, I thought it was strange when I saw 3 cups of vinegar but figured because of dilution with 3 cups of water it would taste fine. Corned beef was good, nothing to write home about it. Won't be repeating this again. Review Body: I'm just rating the pickled cabbage & potato salad, the corned beef I used my own recipe. If you love vinegar then it's a great recipe. I actually dumped the hot potatoes & liquid over the cabbage and it cooked them just enough. Then I let it sit at room temperature for an hour stirring frequently and then I put it in the fridge to chill. If you don't like vinegar or pickled things you probably won't like this recipe. This is now our new side for corned beef!